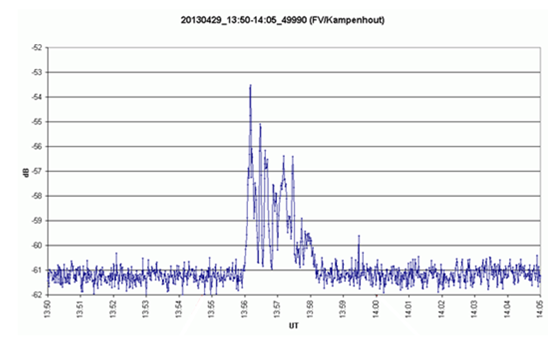 On 29 April, members of the BRAMS network observed radio disturbances at 49.97 MHz. 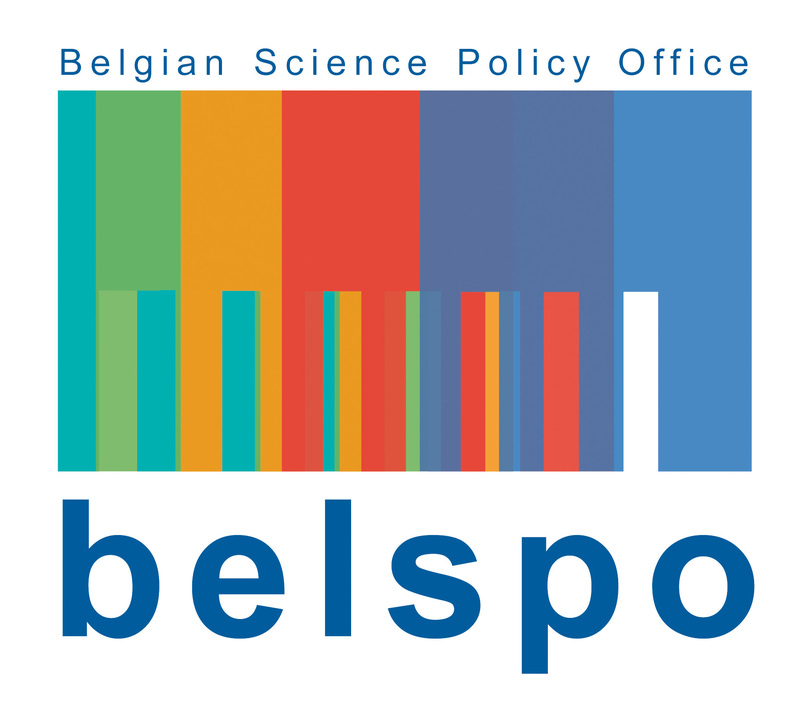 BRAMS is short for Belgian RAdio Meteor Stations, and consists mostly of Belgian radio amateurs listening for meteor reflections from a beacon signal sent out by the Geophysical Centre of Dourbes. The main purpose is to study features of the meteors and their source-particles. Solar eruptions often cause radio disturbances and thus prohibit useful radio observations of meteors. Interestingly though, no such solar eruption was observed at that time, as the x-ray flux remained flat at the C1-level (13:45-14:00UT). 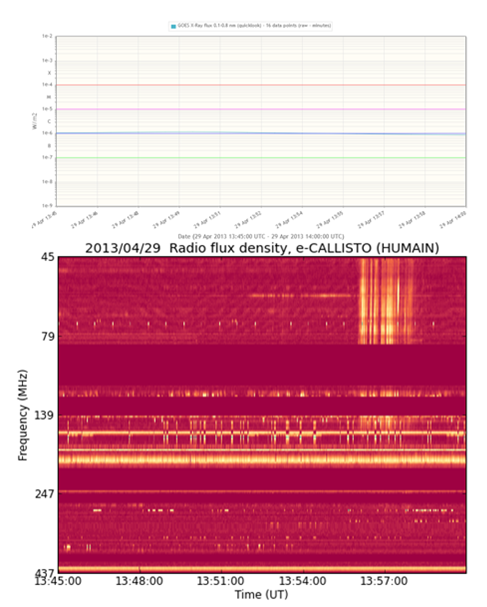 Alerted by the BRAMS observations, the radiograms from the Humain Solar Radio Telescope were checked. These confirmed the radio burst at the time it was recorded (13:56-13:58UT), meaning the observation was very real and not caused by some local interference. Analysis of the burst pattern indicated also that it concerned a group of Type III bursts, meaning that it was caused by very fast electrons travelling through the hot solar corona and away from the Sun. The search for the source of the radio burst without x-ray signature was on! Examination of SDO/AIA imagery revealed nothing obvious. Only at high temperatures in the corona such as with AIA 211, some activity could be seen near the location of sunspot group NOAA 1731, which was close to the centre of the solar disk. However, there were many other active regions that might be the cause of the observed event, but the brightness of the region in EUV preventing the activity to be seen. Now what? Enter the Nançay Radio Heliograph. This radio telescope in the centre of France consists of 48 radio telescopes set up in a T-shape with a 3.2 km maximum baseline. 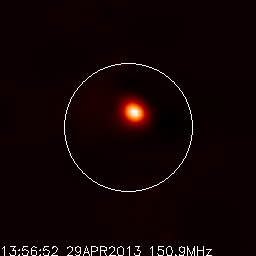 Observing at 150.9 MHz, it allows for a 1 arc minute resolution which is enough to accurately pinpoint the radio source on the solar disk, which has a diameter of about 32 arc minutes. Imagery of the Nançay Radio Heliograph left no doubt: From 13:54 till 13:58UT, there was a radio signal near the disk's centre, that was not present before or after that time frame, confirming that the Type III bursts originated from the vicinity of active region NOAA 1731. Close examination of the EUV and visual imagery revealed that the radio bursts are related to jet-like activity from a tiny region to the southwest (lower right) of NOAA 1731's leading spot. These EUV-jets are also often linked to beams of energetic particles (electrons and Helium isotopes) in situ. Unfortunately, in this case, there was no spacecraft at the right magnetic position to observe these particles. This kind of events has been studied by scientists in the past. 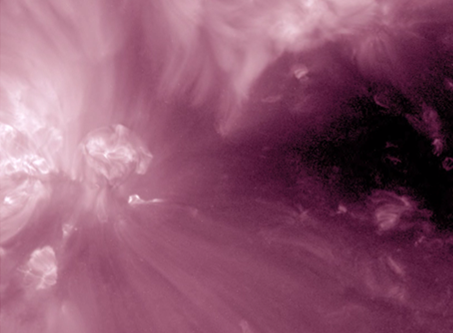 In many cases, the ejecta were linked to interaction with a nearby coronal hole, as open magnetic field lines reconnect with a closed magnetic field line of an active region, which can be tiny (a small dipole). 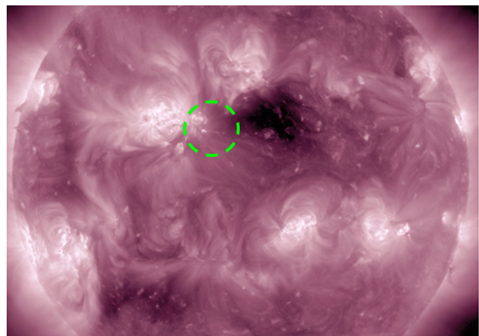 Also in this case, there's a coronal hole interacting with the outer edge polarity of a complex active region, confirming the original studies and explanations. This movie shows some of the jet-like structures between 12:30 and 15:30UT.